The new Code of Practice is part of Ofcom’s work to promote Fairness for Customers, which ensures people get a fair deal and are treated well by their providers. The Code means broadband firms will always have to give customers a minimum guaranteed speed at the point of sale. If a customer’s broadband speed then drops below the promised level, companies will have one month to improve performance, before they must let the customer walk away – penalty-free. This right to exit also applies to landline and TV packages bought at the same time as broadband. Broadband providers must also be upfront with customers about what speeds to expect during peak times. This is because broadband is typically not as fast during the busiest times of the day: 8:00pm – 10:00pm for people online at home, and 12:00pm – 2:00pm for businesses. The new protections are one part of Ofcom’s Fairness for Customers work, and apply whether people are switching to a new provider or changing their current package. Lindsey Fussell, Ofcom’s Consumer Group Director, said: “When you sign a contract, you should be treated fairly and know exactly what you’re getting. Ofcom’s latest data reveals that only three in 20 broadband customers contacted their existing provider proactively and renegotiated their deal last year. And with millions of households able to upgrade to faster broadband for the same or less money, people could be missing out on better deals. Our research also shows that people with a basic, copper broadband connection have less than a one-in-five chance of being able to stream Netflix in ultra-high definition. But if they were to upgrade to entry-level superfast broadband, they would almost certainly be able to do so. 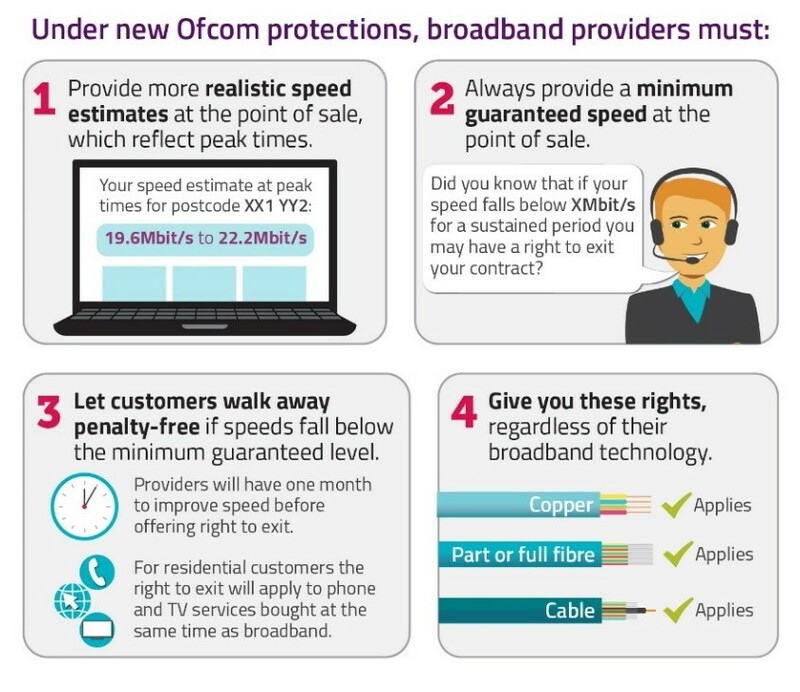 So Ofcom is helping people who want to boost their broadband, switch provider or just renegotiate what they pay. People can also find practical tips for improving broadband speeds on our website. Ofcom will keep a close eye on companies’ compliance with these new requirements, and will report on their performance next year. introducing a simple text-message process to allow mobile customers to switch provider more easily. The new protections apply to all types of broadband package, regardless of whether the connection is copper, fibre or cable. Business customers are covered by BT, Daisy, TalkTalk and Virgin Media. KCOM and XLN have also signed up in principle, and expect to be compliant shortly. In addition, a further 1 in 25 broadband customers renegotiated with their existing provider in response to the company making contact with them. Source: Ofcom’s Switching Tracker data. On a basic, copper broadband connection, 18% of Netflix streams could be reliably delivered in ultra-high definition during the 8-10pm peak-time period. On the next package up – the ‘up to’ 38Mbit/s fibre-to-the-cabinet product – this rises to 98% of streams. Source: Ofcom’s UK Home Broadband Performance data.